Free fall is any motion of a body where gravity is the only or dominant force acting upon it, at least initially. Since this definition does not specify velocity, it also applies to objects initially moving upward. Although strictly the definition excludes motion of an object subjected to other forces such as aerodynamic drag, in nontechnical usage falling through an atmosphere without a deployed parachute or lifting device is also referred to as free fall. The parachute is the most important thing when you’re jumping off an aircraft. The idea of jumping without one is practically stupid. Other skydivers are still finding a way to land on the ground without one by using wing suits. Continue below. No one in there right mind would jump out of an airplane without a parachute but when your thousands of feet up in the air there is still potentials for danger. Something can go when you’re training, just for the thrill of it, or while in an airplane. Fortunately there are ways that you can survive without a parachute. Airline disasters and failed parachutes can still happen. In this situation you’re free falling up in the air without a parachute to help you land safely. Skydiving may look fun in photographs, and the people look like they are having the time of their lives but real life isn’t always picture perfect. You don’t have to be paranoid but being mentally alert doesn’t hurt. You are about to make the first jump in your life or finally put those skydiving lesson to use. Everything is going well. You have applied proper body position and are currently on free fall. Your fear starts to subside and realized what a fool you are for acting like a coward when your feet were on solid ground. You initiate the deployment sequence and then suddenly something goes wrong. 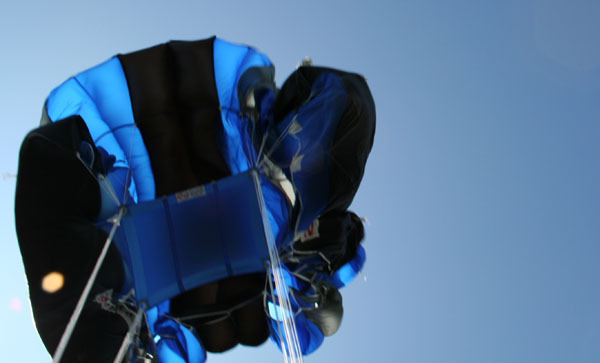 In this situation your main canopy either fails to inflate, get tangled in the line or tore apart. Thinking back to your lessons, you deploy the reserve. Unfortunately the reserve does not work and you’re left pretty much free falling in the sky. The first thing that you have to do is to stop panicking and think. 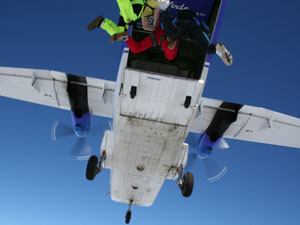 Skydivers get off the plane at 12,000 feet above the ground. During free fall you’re going at 125 miles per hour. At 125 miles per hour you’re going to travel at 12,000 feet in one minute. You only have 60 seconds to come up with a plan. The next thing to do is look for something that may break your fall or at least reduce the impact. Look for a body of water and dive. Make sure that the water will be deep enough. If there’s no water look for trees. Look for a conifer type of tree such as a redwood. If there are no trees and the suburbs loom ahead try to land on the roof of an RV or mobile home. In other cases when an airline disaster strikes, there are also ways that you can survive the ordeal. It’s natural to panic at 35,000 feet, but don’t lose hope, because at 15,000 feet you will get your chance. First look for parachutes that may be lying around in the cargo hold or any piece of wreckage that’s flat and aerodynamically suitable. In other cases you may still be in your seat while free falling. Get off and look for trees. A tree with an excurrent growth pattern is ideal. You can also use snow and steer yourself to land by putting your arms at your sides. If those options are not available the last resort would be landing at your side so that 5 parts of your body equally absorb the shock. 1. As soon as you realize that your chute is bad, signal to a jumping companion whose chute has not yet opened that you are having a malfunction. Wave your arms and point to your chute. 2. When your companion (and new best friend) gets to you, hook arms. 3. Once you are hooked together, the two of you will be falling at terminal velocity, or about 130 miles per hour. When your friend opens his chute, there will be no way either of you will be able hold on to one another, because the G-forces will triple or quadruple your body weight. To prepare for this problem, hook your arms into his chest strap, or through the two sides of the front of his harness, all the way up to your elbows, and grab hold of your own strap. 4. Open the chute. The chute opening shock will be severe, probably enough to dislocate or break your arms. 5. Steer the canopy. Your friend must now hold on to you with one arm while steering his canopy (the part of the chute that controls direction and speed). If your friend’s canopy is slow and big, you may hit the grass or dirt slowly enough to break only a leg, and your chances of survival are high. If his canopy is a fast one, however, your friend will have to steer to avoid hitting the ground too fast. You must also avoid power lines and other obstructions at all costs. 6. If there is a body of water nearby, head for that. Of course, once you hit the water, you will have to tread with just your legs and hope that your partner is able to pull you out before your chute takes in water. * The parachute is folded in straight lines—that there are no twists. * The slider is positioned correctly to keep the parachute from opening too fast.